The new upper Forth crossing is to be named the Clackmannanshire Bridge. The name was revealed by Ochil MSP Keith Brown, who said he was "elated" at the decision. Both Clackmannanshire and Fife Councils had campaigned to have the crossing named after their areas, with members in Falkirk also making suggestions. 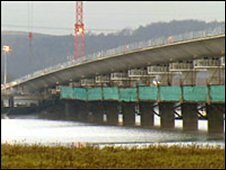 The £120m crossing, to alleviate traffic pressure on the Kincardine Bridge, is due to open on Wednesday 19 November. The decision comes after Transport Minister Stewart Stevenson launched a public consultation in January calling on people to put forward their suggestions for a name. Transport Scotland said the process attracted 178 suggestions, including the 'Bridge at Jones Diary' and 'Blackadder Crossing'. They said the consultation was not a vote but acknowledged responses were overwhelmingly in favour of Clackmannanshire Bridge. New signs with the name 'Clackmannanshire Bridge' will be erected on the near approaches to the crossing. In the Wee County, the campaign attracted high-profile support from the likes of football pundit Alan Hansen and former Scottish Parliament presiding officer George Reid. Fife Council had called for the new crossing to be named the Kingdom Bridge, while a Falkirk councillor had suggested calling it the Wallace Bridge. Mr Brown, the SNP MSP for Ochil, said: "I am elated that the huge campaign, representing the loud and clear opinion of my constituents in Clackmannanshire, has been a complete and total success. "I am sure the fact that the local community whole-heartedly supported the name had a positive impact on the final decision." Mr Stevenson said the project would bring economic benefits to Fife and communities across central Scotland. He added: "That so many people took part in the consultation exercise to name the bridge is a clear indication of its importance to the surrounding communities and we thought long and hard before deciding on the final name." The bridge's construction has involved one of the longest deck pushes of its kind in the world. Upon completion it will weigh more than 32,000 tonnes and be three-quarters of a mile (1.2 km) in length. As well as the bridge itself, the project has also involved extensive upgrades to the connecting trunk road network, with 3.6 miles (6km) of roads and 3 miles (5 km) of cycleways being constructed, as well as associated roundabouts.